Poster of the L-Birds Rally back to Normandy in June 2019 for the D-Day and Battle of Normandy 75th anniversary. 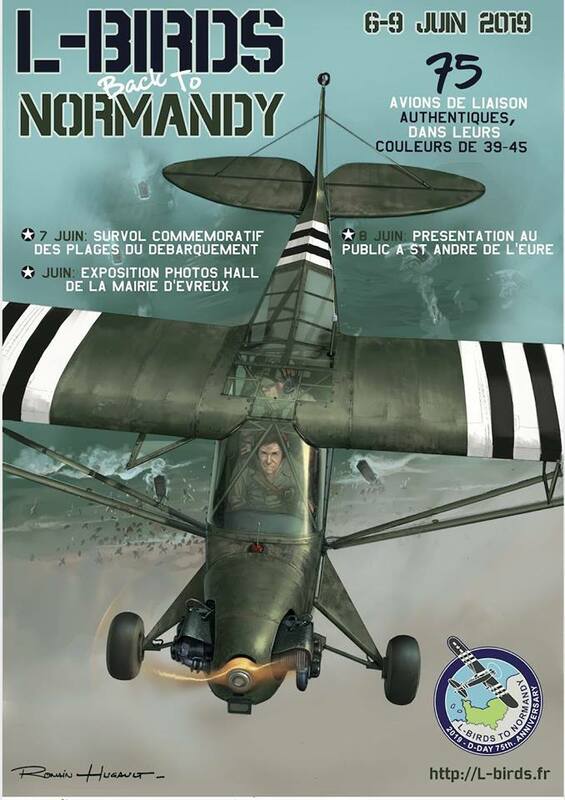 From 6 to 9 June 2019, on the occasion of the 75th anniversary of the Normandy landings, the Normandy association “L-Birds back to Normandy” organizes a new gathering of WW2 aircraft, called L-Birds (L for liaison). 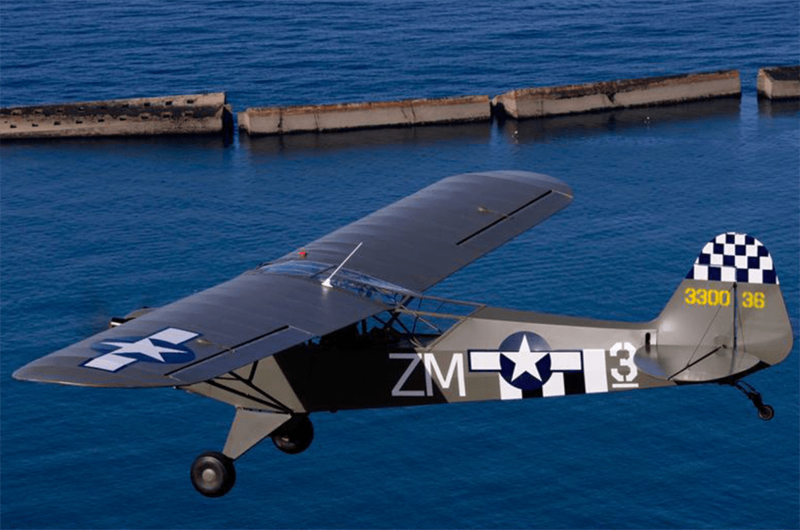 Seventy-five aircraft (including the American Piper Cub L-4 and Stinson L-5 models, the British Auster and the German Storch), all authentic and in their historic colors, are registered and preparing to reach Normandy. The peculiarity of this event is to gather for the first time since 1945 a number never reached of aircraft, true veterans and representatives of the different types of aircraft used during World War II. L-Birds are often forgotten in World War II aircraft books. Yet their role was essential. Light and sturdy, they landed on rough tracks, in fields, on small roads and even on the beaches. These aircraft provided rapid transportation for personnel and sensitive equipment. They also served as air observation platform for firing artillery, as well as aerial photographs to feed intelligence. It is also thanks to them that the concept of medical evacuation has developed considerably. They carried first aid supplies and blood bags to the front, evacuating wounded soldiers. Often senior and general officers used it to reach command posts near the front. Aware of the importance of this small unarmed plane, made up of tubes and canvas, the German command decided to grant a double bonus to its pilots when they shot down one of these allied airliners. On June 6, 1944, the first L-Birds planes were engaged by the Allies in Normandy, notably to direct the fire of the Allied navy artillery. A patrol of five Piper L-4s, equipped with additional gas tanks improvised from oxygen tanks, crossed the English Channel at the command of US Lieutenant Dave Condon (aboard his Stinson L-5). They landed in Saint-Martin-de-Varreville (Utah Beach): this patrol of six L-Birds was the first landing of Allied aircraft on the Norman ground. The L-Birds accompanied the advance of the troops until the end of the war. 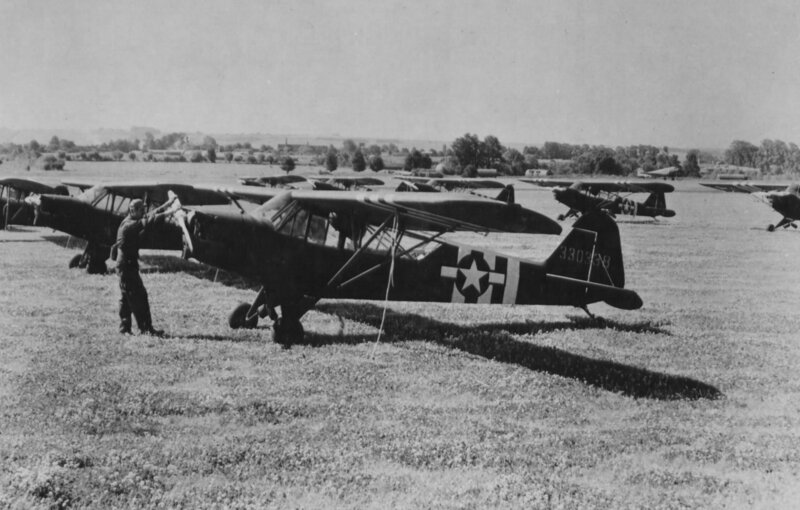 While the fighters and bombers were repatriated to their home country, these small planes were left behind and used to train thousands of post-war pilots. Very few are now preserved or restored in their original condition. – five Stinson L-5 Sentinels that represent almost all aircraft of this type in flight status in Europe. – The only Piper L-14 in flight status in the world (flying from Madrid). – The only Burma Auster Mark III remaining in the world, as well as two rare Auster Mark V.
– Two very rare Fieseler Storch. – The unique Stinson VT-77 in Europe. – The Fairchild 24 which was owned by Louis Breguet after leaving the Royal Air Force in 1947. – The very rare Miles M.38 Messenger, aircraft of Marshal Bernard Montgomery. A Piper L4 above the artificial harbor of Arromanches. June 6, 2019: arrival of planes from all over Europe to Saint-André-de-l’Eure. Presentation of the aircraft to the media, most of which are coming back for the first time since 1944 in Normandy. June 7, 2019: “D-Day Beaches” commemorative flight of more than sixty aircraft from World War 2, between the D-Day museum of Arromanches and the Overlord museum of Colleville-sur-Mer. 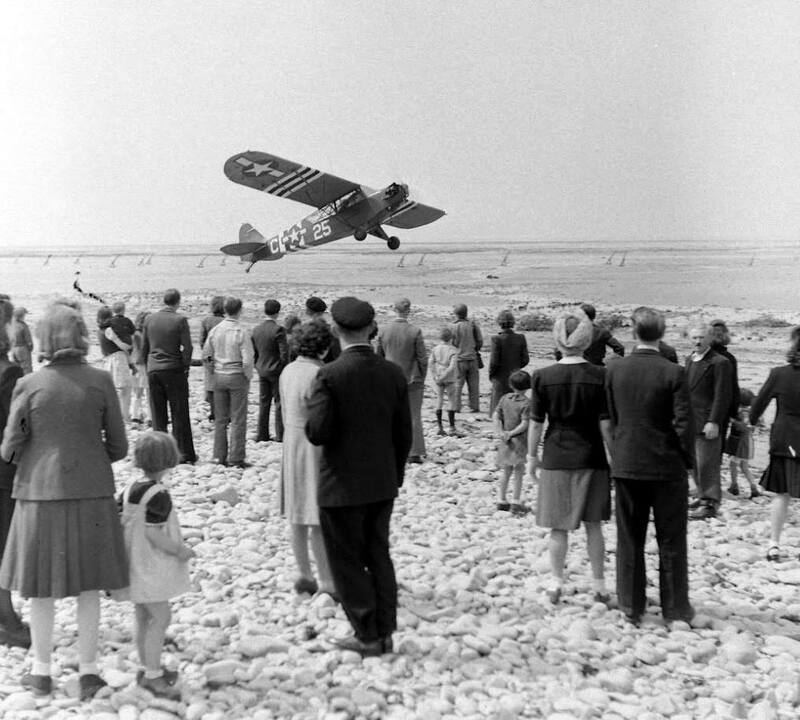 June 8, 2019: presentation to the public of the planes and meeting with the pilots on the aerodrome of Saint-André-de-l’Eure. June 9, 2019: Memorial Flight “Utah Beach / Cliff / Lessay”. All information can be consulted on the L-Birds back to Normandy website: http://l-birds.fr/. Discover the complete program of commemorations of the 75th anniversary of D-Day by clicking here.